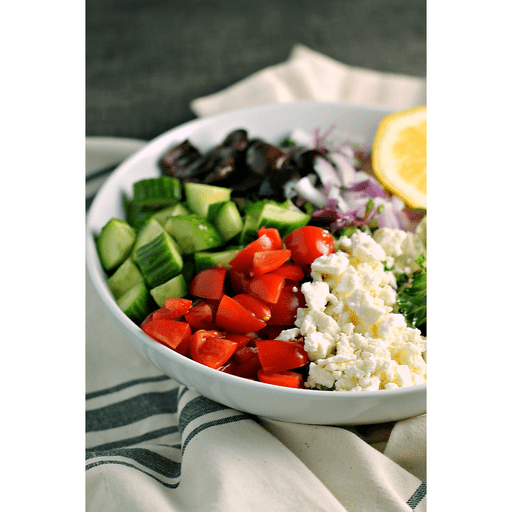 If you’re looking for a salad that is full of flavor and packs well for lunch, this Kale Greek Salad is your new best friend! With fresh veggies, creamy feta and a simple Greek-inspired vinaigrette, this colorful kale salad does not only hold up well, but it is also a scrumptious way to add nutrition to your dinner table or summer party potluck. 1. In a large bowl, toss together kale, tomatoes, cucumbers, red onion, olives and feta cheese until mixed. 1. In a small mixing bowl, whisk together olive oil, lemon juice, red wine vinegar, honey, oregano, garlic powder, salt and pepper. Pour over salad and toss to coat. Serve. Although a delicious and nutritious side salad or meatless meal, this dish can easily satisfy a heartier appetite with the addition of grilled chicken, gyro meat (found in our Deli Department), salmon or your favorite lean protein. Calories 190, Total Fat 17g (Saturated 3g, Trans 0g), Cholesterol 5mg, Sodium 220mg, Total Carbohydrate 9g (Dietary Fiber 2g, Sugars 6g), Protein 3g, Vitamin A 35%, Vitamin C 45%, Calcium 8%, Iron 4% *Nutritional values are an approximation. Actual nutritional values may vary due to preparation techniques, variations related to suppliers, regional and seasonal differences, or rounding.